3 Best Bike Tours in Norway - Which Bike Tour is Best? Norway is an incredible place for a bicycle tour of any kind. The land is beautiful, the accommodations are lush, the locals speak English, and the food is to die for. Plus, this Scanvinavian country isn’t nearly as expensive as everyone says it is – especially when you book a bike tour package with a local tour company. With so many wonderful cycling holidays in Norway to choose from, I’ve decided to feature three of the country’s best self-guided bicycle tours. This self-guided bicycle tour starts and begins just outside of Norway’s second-largest city and most popular tourist attraction – the city of Bergen. From there, you’ll take a short train ride to the start of the tour, cycle past dozens of high-mountain waterfalls, cruise past small lakes, and spin your legs along the edge of Norway’s most famous fjord – the Hardangerfjord. 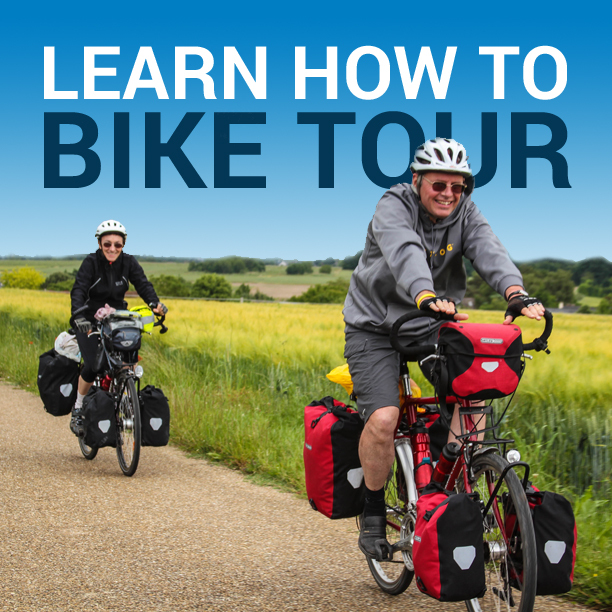 While on the tour, you’ll stay in high-end hotels, eat delicious breakfast/dinner buffets, and enjoy scrumptious packed lunches that you carry with you on your bicycle as you ride. This 6-day self-guided bike tour costs approximately 8,950 NOK per person and is the tour you want to participate in if you’re interested in experiencing classic fjord Norway. If you want to see Norway on a budget and are interested in seeing the more remote fjord regions around the city of Bergen, the Fjord Cycling Route Bike Tour with the tour company, Berg Fritid, is your best bet. This bike tour starts and ends in the tiny town of Matre, Norway (a 2-hour bus ride north from Bergen) and takes you in a 5-day loop around the Sognefjord region. 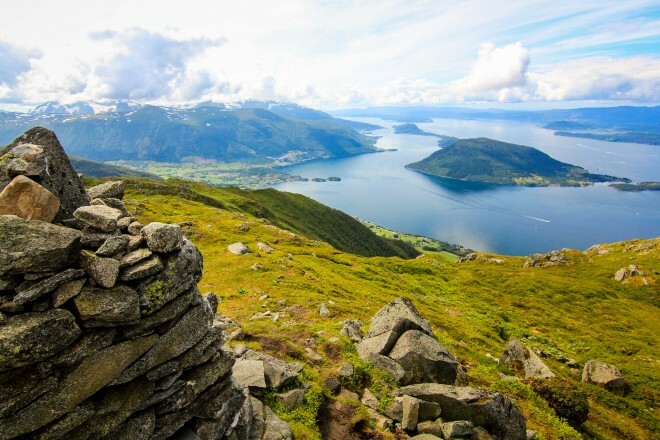 During the tour you’ll have the option of mountain biking above a giant lake, cycling along the edge of Norway’s largest and deepest fjord (the Sognefjord), watching for whales and eagles and deer all around the route, and staying in some of the most charming accommodations anywhere in Norway. At only 6,660 NOK, this 6-day self-guided bike tour is a real steal. Finally, the Around Sunhordland by Boat & Bike tour is another self-guided bicycle tour operated by the Active-Norway tour company. This unique cycling holiday begins in the picturesque town of Rosendal and then stretches south and west to the coastal villages of Skånevik, Leirvik and Bekkjarvik. During this romantic bike tour, you’ll be spending much of your time cycling along the water’s edge as you zip along the edge of Hardangerfjord, take several small ferry boats across the water, and marvel at dozens of small, idyllic islands. As with each of the tours listed here, the accommodations are first class, the food and drinks are superb, and the tour is completely arranged for you. Just book the dates you want to travel and the tour company will do the rest for you. Your bags will even be transported for you, from one hotel to the next, so you don’t have to carry your things with you on your bicycle as you ride. This 5-day self-guided bike tour in Sunnhordland Norway costs 8,150 NOK per person and is the bike tour you should select if you love the idea of cycling across several small islands in Scandinavian Norway. The tours featured here are truly the best bike tours in Norway and no one tour stands out above the rest. While the food, accommodations, and services provided by the tour companies are all to be commended, it’s really the landscape that changes on each of these bike tours. If you want to see classic Norway, you should sign up for the Biking Hardangerfjord Bike Tour with Discover-Norway.com. If you’re on a budget or are interested in the more remote regions of Norway, consider signing up for the Fjord Cycling Route Bike Tour with Berg Fritid. And if you’re a water/island lover, then the Around Sunnhordland by Boat & Bike tour is your best bet. Whichever bike tour you sign up for, you’ll be happy with your decision to cycle in beautiful Norway! This entry was posted in Bicycle Touring Pro Articles, Europe, Locations, Norway, Product & Service Reviews and tagged best bicycle tours, best bike tour in norway, best bike tours in Europe, best bike tours in norway, bike tour, cycling holidays, cycling in Europe, cycling vacation, Europe cycling holidays, Europe tour packages, fjord bike tour, fjord cycling route bike tour, fjord norway, norway bike tour, romantic bike tours, romantic cycling holidays. Ever consider a suspension fork for long distance touring vs rigid? I am a older rider, currently riding a surly ogre bike I built myself, and in 4.5 years when I retire and start a long distance tour, wonder if a suspension fork would be better. I have some neck, hand, and back issues, and hands frequently go numb. I use the cane creek thud buster for the seat suspension and find it works great. I iwould use a trailer like the bob or mule to carry the gear, along with perhaps rear panniers and a handle bar bag..
Another question, how many calories a day do you think you burn cycling ? How many do you eat per day ? How do you manage the weight loss? As for how much food to eat on a bike tour, it is going to vary from person to person and the amount of time that is put in on the bike each day, the terrain that is covered, etc. I’ve never exactly measured the amount of calories I eat in a day, but I can tell you that I’m pretty active during my regular life, so I don’t eat too differently on my bike tours than when I do at home. This is why I suggest people start training for their bike tours while they are still at home. Training at or near home allows you to adjust things not only on your bicycle, but with your diet as well. What are the daily miles for each tour, and how hilly, challenging, etc?